Warm winter temperatures were forecasted over most of the state, including the usually overcast/rainy northernmost part. I'd paid very little attention to that part of the Coast Ranges to the far north and thought this might be a good opportunity to chase down some CC-listed summits and some prominence peaks as well. My primary target for this five-day trip was the Whiskeytown Unit of the Whiskeytown-Shasta-Trinity National Recreation Area. The peaks here were lower than those of the nearby Trinity Alps and would likely be snow-free. There are six CC summits clustered in the mountains above Whiskeytown Lake. Some of these could be accessed by rough dirt roads, so I brought my mountain bike to help with that effort. After some four hours of driving to Buckhorn Summit on SR299, I managed to drive about two additional miles up E. County Line Rd. This dirt road has not been maintained for some time and has become rutted to the point where I got stopped by some deep grooves that I might not have gotten out of had I tried to get over them (in fact, two that I went over were somewhat questionable and I took a bit of a beating). Undeterred, I found a place to park off the road and got out the bike. It was at this time that I realized I had forgotten to bring my daypack. This was somewhat of a major blunder - my fleece, gloves, headlamp and assorted other essentials were in that pack and I would have to find a way to make due without it. I scrounged around and found I had a light jacket and an extra pair of leather gloves. My hat had thankfully not been in the pack. This would be pretty much all I'd have besides the Gatorade I'd carry with me. It was probably the least-prepared I'd ever been as I felt some combination of stupid and anxious. It would have to do. E. County Like road runs nearly to the summit of Bully Choop, a P2K outside the NRA boundary, though the road runs partly through the west side and just past Buckhorn Bally. The names are funny sounding thanks to the survival of this local Indian term for mountain, alternately found as Bally, Bully, or Bolly. Pretty much every one of these five days would include a peak with one of these variations. Today's outing would cover 25mi with more than 5,000ft of gain - not what you would call a warm-up day. It didn't help that I wasn't getting started until nearly 11a but the bike would make all the difference. I had expected to carry Gatorade in my daypack with the bike so I hadn't brought any water bottles. I improvised for these, recruiting a plastic Starbucks cup and a partly-collapsed Gatorade bottle. My jacket I tied around my waist. The road is fairly steep and made for a tough ride. Portions that were too steep I walked, pushing the bike ahead of me. After the first mile the angle eased as I entered the Whiskeytown Unit about half a mile north of Buckhorn Bally's summit. Parking the bike at where the road crests, I found an old side road, fallen into disuse with downfall and brush, that leads to the terribly uninteresting summit. There are a few clumps of rocks vying for the highpoint completely surrounded by trees, blocking all views. Though it sports 900ft+ of prominence, all of this is lost in the forest. Note to self: Scratch this one from the CC list. Back on the bike, I now had almost 1,000ft of elevation to lose over the next several miles as I made my way down to Coggins Park, a primitive camping area just off the road. Past Coggins Park, the road features two relatively easy miles before beginning a steady climb of over 2,500ft in six miles. Views begin to open up as one climbs higher, with the snowy peaks of the Trinity Alps visible to the northwest and the massive Mt. Shasta rising above lower hills to the northeast. Immediately to the east is the highpoint of the Whiskeytown Unit, Shasta Bally. Though only 2.5 air-miles away, it would have to wait for another day. The road passes around the northwest side of Shoemaker Bally which I had optimistically hoped I might get to today (I would not, it turns out). By noon I had reached the saddle west of Shoemaker Bally where one can see the road continuing to the southwest as it climbs up towards Paradise Peak and on to Bully Choop. Another hour and a half of steady, slow riding got me to the base of Bully Choop. The road here is too gravelly and too steep to make riding worthwhile (the downhill would be an exercise in not crashing). I left the bike and walked the remaining distance to the summit. Those with high clearance vehicles can drive to within half a mile where a gate bars further progress. The summit features a two-story USFS lookout, locked and shuttered at the moment. Erected in 1978 to replace one from the 30s, it was one of the last lookout towers to be erected. Unlike most of the other lookouts, the Bully Choop lookout allows one to visit the viewing platform even when the lookout is closed. Underneath, I found a reference mark but no benchmark, the latter appearing to have been removed. No register either, but I didn't really care - any summit that one can drive to tends to have a messy and disorganized register. The USFS probably maintains one inside the lookout for visitors to sign on days it is manned and open. The views are outstanding, extending over many, many square miles in all directions. 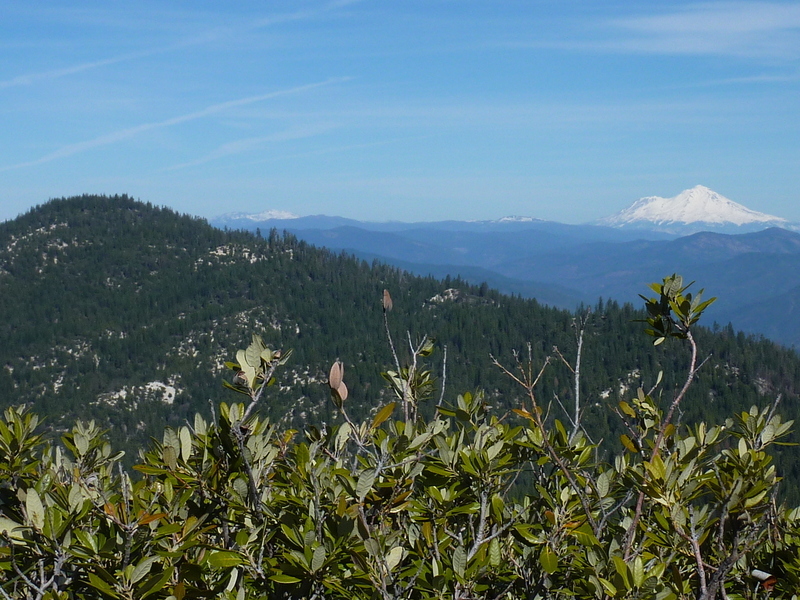 Snow can be seen on the Trinity Alps, Shasta and Mt. Lassen, the latter more than 70mi distance to the east. There was some snow in the shadier spots of Bully Choop, but for the most part is was barren though nearly 7,000ft in height. On a normal year there would be several feet of snow on the ground and getting here would be a much bigger chore. On my way back down from Bully Choop I stopped to hike the short distance to Paradise Peak in the way of an easy bonus. There is a shed/cabin located on the west side below the summit. A pair of worn-out wooden showshoes were leaning against one side with some other useless gear found elsewhere. The cabin doors were locked. At the top I found a summit rock I could not climb - a 5.9+ monolith that had no holds of any sort I could find. A nearby rock outcrop was of nearly the same height so I climbed that as consolation. Just below these rocks on the north side is a small shed and a communications tower. Views were similar to Bully Choop, though without the view west across the range. As I was returning to my bike along the old firebreak I had used to reach the summit, I was surprised to find an iPhone lying in the dirt. The screen was badly cracked but it otherwise looked like it might be servicable. I stuck it in my pocket and returned to the bike. It would be another hour and a half before I rode back to the van, but I was done in plenty of time - it was only 4:15p and I had more than an hour of daylight. I had not found the old road leading to Shoemaker Bally that I had expected, so that would be a bigger deal than I'd hoped. I decided to stay put where I was for the night and make another ride back up and over Buchorn Bally to do Shoemaker Bally, Little Bally, and possibly Ducket the next day. When I got home I showed the iPhone to my son. He had a charger that fit the old 4s model. I would have been happy to return it to its owner, but the screen was locked and held no information. Apple, it seems, is completely unhelpful in returning lost phones though it should be a simple matter to register them and track them by their unique MAC address. The best we could do was reset the phone which then deletes everything to factory settings. It still has the same unique MAC address, but Apple won't help you find the owner. For $70 my son got the battery and glass replaced and now uses it instead of his Android phone. My daughter has asked me to find another iPhone, please.